Say what you will about Google Glass, but it continues to rack up third-party support. Pandora is the latest to throw its hat in the Glass ring. Hatched at a recent company Hack-a-thon (we're getting a lot of those lately), Pandora for Glass arrives today. Taking advantage of Glass's hands-free controls, Pandora for Glass can get Explorers into their favorite stations via voice controls. But voice controls aren't limited to accessing existing stations; users can also create new ones using just their vocal cords. 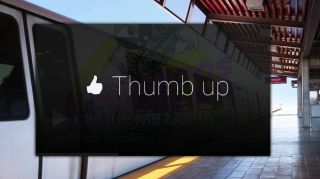 The touchpad offers more advanced functions, not only letting users jump into their stations but also granting them thumb up and thumb down powers as well as pause, skip and stop. Listening options include Glass' built-in speaker plus bone conduction method, the mono earbud included in the Explorer kit and a double-earbud accessory. To get Pandora for Glass, Exploeres can head to google.com/myglass, sniff out Pandora, turn it ON on the detail page (sign-in required), and give the requisite basic info approval. From there, Pandora will arrive over the air and you can start streaming to your ears' content.